TechHighway offers following services with well defined processes and effective implementation of the knowledge, gained over 15 years of experience. Various website tracking tools such as Google analytics, Google adwords, Post-Click tracking, C2C tracking, eSearch vision tracking, Google website optimizer, ClickTale etc. With our strong experience in this field we have built up robust development cycle model which is efficient and result oriented. Above depicted model allows us to resolve the problems observed in particular phase in the same phase. It does not let the problem grow and produce any severe impacts. This in turn reduces the development cost in totality. Following sections describe each phase by detailing various activities performed during the implementation cycle. This is the beginning phase of the cycle. It is essential to have a close interaction between business system specialist from client’s side and project manager from our side to formulate the requirements. Design phase uses Requirement understanding document as a base and is very crucial in the whole cycle. The outcome of this phase is the technical blueprint of the system. The success of Development phase depends on how much detailing is done during Design phase. We make sure that technical experts from our side are involved in design reviews and provide important timely inputs. 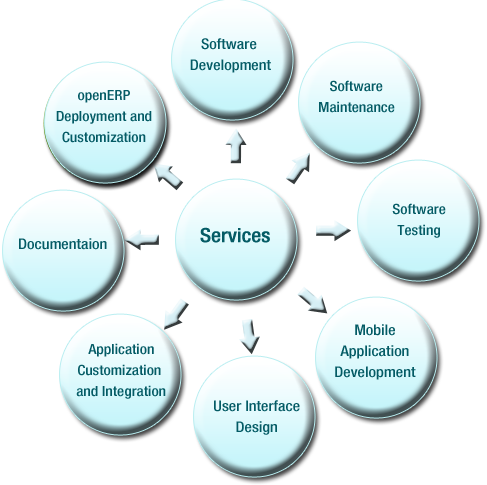 This is the phase where actual execution of the design into an implementation of software system is done. If design phase is executed with a deep thinking, Development phase gets executed without many complications. In this phase validation and verification of the software system is done. Our team is equipped to perform manual and automatic testing. 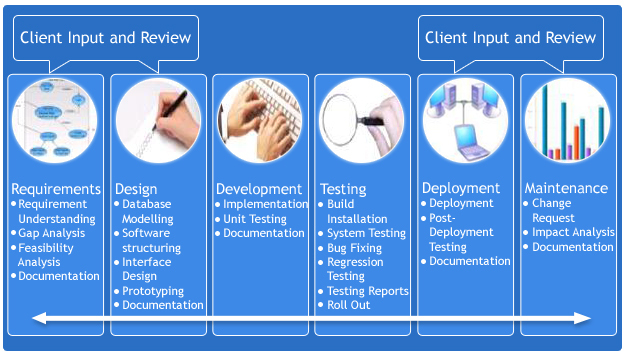 We take care of end to end testing, functional testing, integration testing, regression testing, acceptance testing. This is the phase where deployment on various staging and production environment is done. Input to this phase is tested build on test and various staging environment. Software does undergo changes even after it is delivered. There can be various reasons for such changes. We are responsive and flexible to accommodate such changes in meticulous manner. While designing the system, we make sure that the design is scalable.